1 Day Sale Only. Limit 1 Set per customer. 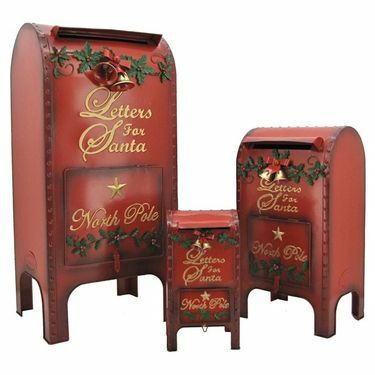 Get ready to bring a huge burst Christmas spirit to your holiday home, your store, or even your entire neighborhood with our newest set of three "Letters for Santa" Vintage Christmas Mailboxes! Last year our Set of 3 Mailboxes were such a HUGE hit, we raised the bar this year and revamped the original design to make them even better. These new Santa Mailboxes are constructed with a strong powder coated iron and hand painted in a deep burgundy with gold lettering. The mailboxes have a front that is able to open allowing for the retrieval if any letters that may be put in. A small latch has room for a lock if necessary too. Heavy gauge metal, with golden letters on front easy for the kids to read, "LETTERS FOR SANTA" to attract adults and kids alike. Makes for a great decoration for both indoor and outdoor use. Small and Medium sizes are a smaller scaled version of the Larger Size design and ships nested inside. Great for desks and counter-tops, and easy storage.